Every year, Forbes evaluates the most exciting developments in technology and lists what they believe are the most influential and powerful developments in the year. For 2013, one of the top choices for tech and gadget development is the improvement and increase in availability of no touch technology. No touch technology actually encompasses a wide number of services and devices. In some cases, such as the Motorola X, the no touch is incorporated through the voice recognition and activation features. In others, such as the Kinect, the no touch is incorporated through the body scanning and movement recognition program. 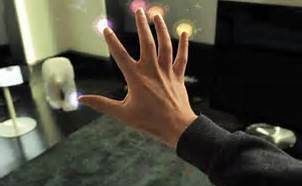 Regardless, no touch technology has had quite an impact, and it’s going to become increasingly popular. Here’s what you’ll need to know. Your body is one of the most unique components of who you are, and Science Daily predicts that no touch technology will increasingly rely on body scans. This could be everything from the virtual fingerprint scan, where you don’t have to touch the screen, to the famous retina scan. It looks like this particular technology will be one of the most successful methods for locking and securing devices from unauthorized users. The Kinect and Wii are two of the most popular and well known devices that use no touch technology. However, at the same time, some issues have come up when the devices are not quite accurate enough. As anyone who has attempted to play games on these devices can attest, moving out of the ideal range even by a little bit can significantly reduce the precision of game play. As a result, they will most likely be increasing the general sensitivity while also improving the mechanisms for screening out background noise. While smart phones are becoming a key location for the development of no touch technology, it looks as if the gaming community is going to dominate this particular field. The first forays into the invention came from the gaming community, and the highest demand for these services is in the gaming community as well. One of the most exciting new gadgets coming out in 2014 is the Meta SpaceGlasses. They’re inspired partially from Star Trek holodeck technology and classic 3D glasses. While the developers have stated that the glasses can potentially be used for creative and analytical purposes, the main reason for their development is gaming. No touch technology will increase in popularity and sophistication as they continue to refine it. It’s likely to become key to the various forms of securing devices and authorization. Sensitivity must be fine-tuned further. However, the market is ready for this technology. Most likely, the gaming community will assist the most with the development. This is the part of the market with the greatest desire for the technology as well as the willingness to spend the money on it. The Meta SpaceGlasses will probably make great strides in this development as well. The author is an avid blogger and writes for Techcoon.com which is a leading technology trends news and review blog for tech enthusiasts. The Blog features some of the best inside scoop from the technology industry and features articles from industry insiders with a rich technological background.